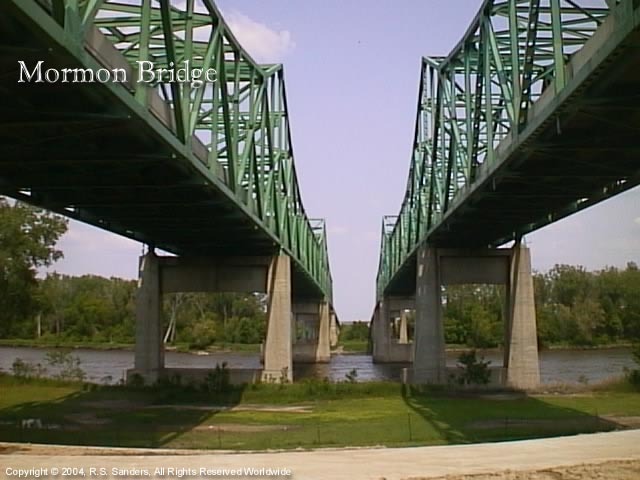 The Mormon Bridge is built over the Missouri River in the same location as the historic Mormon Ferry (known as the second ferry). Florence's history is centered on this location. Due to the Mormon Ferry being built here, it was learned that this location along the Missouri has the unique feature of having a rock bottom, which was the basis for why the same area was chosen to build Florence. The idea being that where there was a rock bottom in the Missouri River would be an ideal place to build the bridge that would allow the transcontinental railroad to cross, and thereby influencing the growth of the community on the Nebraska side of the river. The Mormon Bridge was constructed starting in 1952, and was built to be paid with tolls. If you have ever had to pay tolls for anything, you know that they never seem to get paid off; in the case of the Mormon Bridge, it did get paid off on April 21, 1979. As a result, the toll booth was no longer necessary.